While most of Drexel’s population was enjoying home cooking and a well-earned break from classes, this was not the case for in-season athletes, who continued to work on their craft amidst the holiday season. 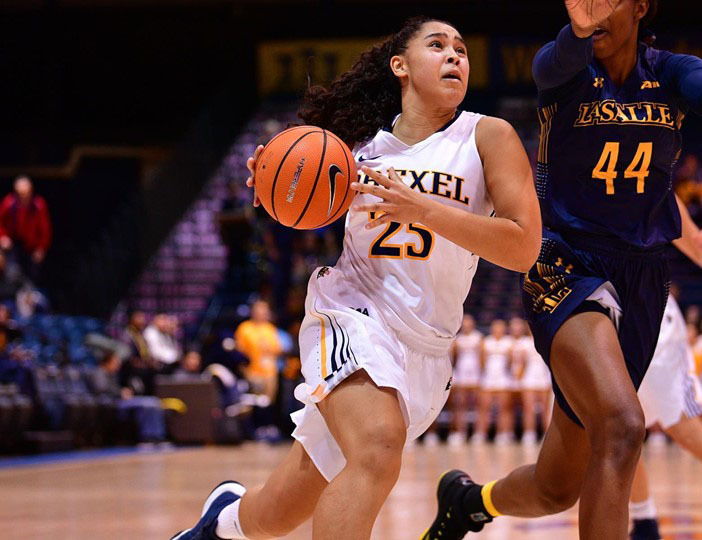 Such was the story for Drexel women’s basketball team, who stared down a challenging late December and early January slate that included matchups against top-25 ranked Syracuse University, Cornell University, the University of Delaware, Hofstra University and James Madison University. Their game against the Orange of Syracuse Dec. 9 was one that almost certainly was circled on the calendar for both sides. For Drexel, this represented the opportunity to knock off a ranked opponent for the second straight year; a resounding statement that the successes of late is worthy of national recognition. On the other end of the spectrum, Syracuse was likely still smarting from their loss to the Dragons in the waning seconds of last season’s contest, and were eager to prove that the result was nothing more than a fluke from an upstart challenger. It didn’t take long, however, for the home team to realize that despite some troubles historically, this generation of the Drexel women’s basketball team is not one that can be taken likely. The Dragons came out firing from the opening tip, shaking off a streak of slow starts that has plagued them for much of the early season. Senior Megan Marecic’s three-point stroke was the weapon of choice in the opening half, resulting in an astounding 15 points on 5-6 long range attempts. Her running mate off the bench, junior Tereza Kracikova, provided a low post threat that kept the Syracuse defense honest. At half, it seemed as though lightning might strike twice with Drexel heading into the locker room with an eight-point advantage, 41-33. But while head coach Denise Dillon likely warned her group to brace for an early second half run from the Orange, her words were not enough to stop a 10-0 streak that gave the home team the lead. A neck-and-neck third quarter resulted in a five-point Syracuse advantage by the quarter’s close. Though it stayed a two possession game for much of the fourth, the defense from the Orange was stifling enough to prevent a legitimate threat from Drexel. A final score of 72-62 loss for the Dragons unfortunately masked the competitiveness of the matchup. Though not achieving the result they had hoped, the admirable performance at the end of a long road trip undoubtedly provided needed momentum for the Dragons heading into their late December home games. They first closed out their non-conference schedule with a game against Cornell Dec. 21. Drexel utilized a balanced offensive attack to run the Big Red out of the building. Sophomore Aubree Brown’s 15 led the way on that end of the floor, while the defensive intensity remained strong en route to a 61-39 victory. Next up on the schedule was the Colonial Athletic Association season opener against Delaware. Similar to their outing against Syracuse, Marecic fueled a strong start that resulted in a 22-11 first half lead. And while their offense cooled down in the second, it set the stage for a dominant defensive effort that forced the Delaware attack into making costly mistakes. This ultimately became the story of the game, with the Blue Hens committing 20 turnovers to Drexel’s 10. In fact, despite an early second half push, Delaware never cut the lead to single digits for the remainder of the game. With senior Kelsi Lidge and sophomore Bailey Greenberg’s double-digit efforts leading the way, the Dragons pulled away to a 74-53 victory. Their New Year’s eve game against Hofstra, in addition to offering an opportunity to end the calendar year on a high note with a three-game winning streak, featured additional historic relevance: a win would give Denise Dillon the most career wins in program history. While they had enjoyed a recent streak of hot starts to games, the frigid temperatures outside seemed to infiltrate their way into the shooting numbers for both teams at the outset. 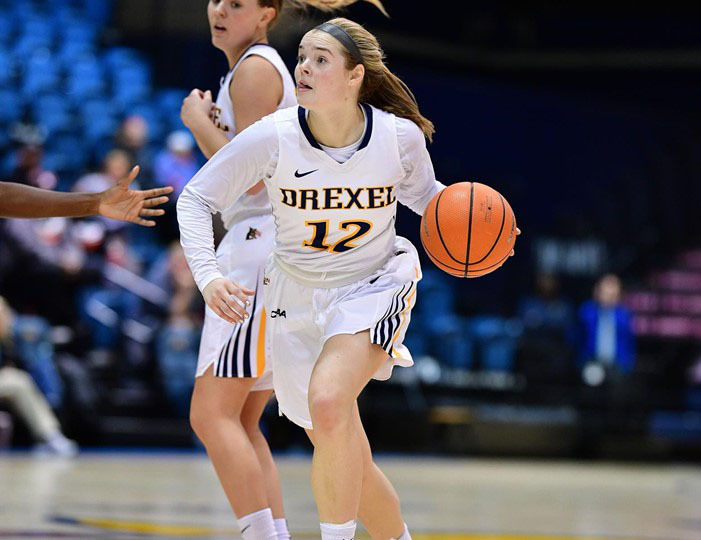 Thankfully, when the Dragons, led by their impressive freshman Hannah Nihill’s eight points, began to get in a rhythm offensively, the Pride remained stifled by a fierce Drexel defense that only allowed 12 points over the course of the entire half. As was the case against Delaware the game prior, Drexel leaned on this defense in the game’s crucial moments, keeping the game at a relatively comfortable margin for most of the second half. In addition to 11 points and six rebounds from Nihill (an effort that would play a large role in her winning a second CAA rookie of the week award), senior Sara Woods earned her first career double-double with a 14 point, 10 rebound performance. This was enough to firmly write their coach’s name in the record books. With the win, Denise Dillon achieved her 265th career victory, passing Lil Haas for most total wins in Drexel women’s basketball history. In terms of this season’s implications, the win also pushed Drexel to a 10-4 record on the heels of seven wins in December. For much of their next game against James Madison Jan. 7, it appeared as though this magic would carry into the new year. Greenberg came out firing, finishing the first half with 13 points to pace her group in a 22-20 first half. However, a halftime adjustment that keyed in on Greenberg on the defensive end caused the unbalanced Drexel attack to sputter to the tune of a 15-0 third quarter run, erasing a slight advantage and resulting in a double digit lead for the Dukes. Dillon and her coaching staff responded with adjustments of their own heading into the fourth and the team responded, cutting the lead to two with over six to play. Ultimately, however, they appeared to have used up much of their available energy in the comeback effort and once again got cold. With James Madison pulling ahead late, Drexel was forced to take their first loss in nearly a month, falling 56-48. They traveled to the College of William & Mary Jan. 9 to avoid dropping to .500 in the conference. The Dragons were trailing by one point after the first half of play. The Dragons had only shot 9-32 from the floor against William & Mary’s 10-19. WIth 23 seconds left in the fourth quarter, the Dragons were down 50-47. Coach Dillon called a timeout and then substituted in Marecic hoping that they could tie the game and force an overtime. Brown grabbed a rebound, and the ball found Marecic with six seconds left. A three-pointer from Marecic tied the game 50-50. The Dragons needed the momentum set up by Marecic’s shot to lead into overtime. Two minutes into overtime, the teams were tied again 56-56, but the Dragons were in control. They would lead for the remainder of the overtime with the final score being 65-58. The women will return to the Daskalakis Athletic Center Jan. 14 for a game against the University of North Carolina Wilmington at 2 p.m. In the two times the teams met last season, Drexel won both games.